A surprising number of people have emailed me to say that they want to get into Star Trek but don't know where to start and/or they'd like to watch it but don't have time to watch all of it. Of course, I think it's best to just sit down and power through the entire cannon but I get that not everyone is a hermit with loads of time on their hands and a seemingly inexhaustible stamina for Netflix marathons. To these people, I present, "Five Essential Episodes From Season One." -As I've previously mentioned, this episode is full of amazing stuff. It sets up important relationships between characters. It gives us backstory and the inner thoughts/fears/passions of characters in a streamlined, graceful way. And, it's crazy entertaining. Any episode where Spock cries AND Sulu runs around without his shirt goes on the "Essentials List." Stand out line: I can't change the laws of physics. I've got to have thirty minutes. -This is a classic, clever, intriguing episode. It's an example of what Star Trek does well. The whole crew is involved and lead by an especially brilliant Kirk. We see some great Kirk/McCoy, Kirk/Spock stuff here and the baddie is classic Trek: strange and surprising. Stand out line: I've already got a female to worry about. Her name's the Enterprise. 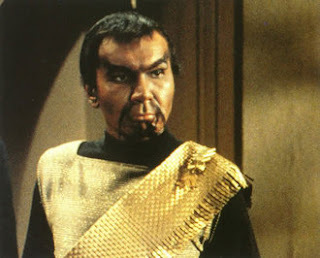 -Here is the first ever encounter with the Romulans. The constant back and forth between Kirk and the Romulan commander (played by Mark Lenard) is captivating. Issues of race, loyalty, and duty are all brought to the surface in this one and framed by the seemingly innocent and happy occasion of a ship-board wedding. Stand out line: You and I are of a kind. In a different reality, I could have called you friend. -Khan makes his big debut in this episode. Setting up some of the most iconic stuff in Star Trek, you really can't miss this one. Stand out line: A beautiful woman. My name is Khan. Please sit and entertain me. 5-"The City on the Edge of Forever"
-Pretty much the most iconic episode of The Original Series. The Kirk/Spock/McCoy trifecta is in full swing here. Missing this episode means missing a huge piece of Star Trek history. The Klingons make their first appearance in this episode which, on its own, is pretty good with some classic Star Trek themes. 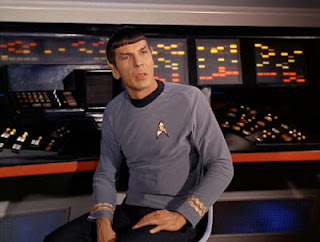 This episode is worth watching just to see Spock be a badass when the Squire shows up and asks who screwed up his game. Alright, that's it! If you're new to Star Trek and you have questions, feel free to ask! If you're a longtime Trekker and you feel like I grossly mis-stepped in the making of this list, let me know. I did leave off a few that are considered pretty classic but this list is solely my opinion and I'm sure readers would benefit from even more Star Trek knowledge/analysis. Hooray! Let me know how it goes! Great list! I would only add one: Devil in the Dark. It's one of my all-time favorite ST episodes, and I think it has some classic Trek moments and covers some classic Trek themes.